Italy has long been associated with romance, and destination weddings here grow in popularity each year. We specialize in Italy luxury weddings with venue options for practically any couple. When most people think of Italy, they think of the rolling hills of Tuscany, with quaint villages and peaceful villas surrounded by gardens and full of Old World charm. Located in central Italy, the scenery in Tuscany is breathtaking and the gourmet food is world-renowned. Some of the most famous cities in the world – Pisa, Siena and the region’s capital, Florence – are all found in Tuscany. Wedding venues in Tuscany are numerous and satisfy all different personality types. Choose from a wedding weekend at a stately country home or Tuscan farmhouse; a regal event in a medieval castle surrounded by vineyards near the walled cities of Chianti; or a Bohemian getaway at a private villa. Did you know that you don’t even have to leave Tuscan to enjoy a beach wedding? Your ceremony in the sand awaits in the “Tuscan Riviera”. Florence is a world of its own. Host a simple, scenic rooftop ceremony surrounded by the spire and domes of Florence’s beautiful Old World architecture, then retreat to a charming ballroom complete with modern amenities and catered by the best chefs in the industry. Our designers and planners can make your dream wedding in Italy come to life. 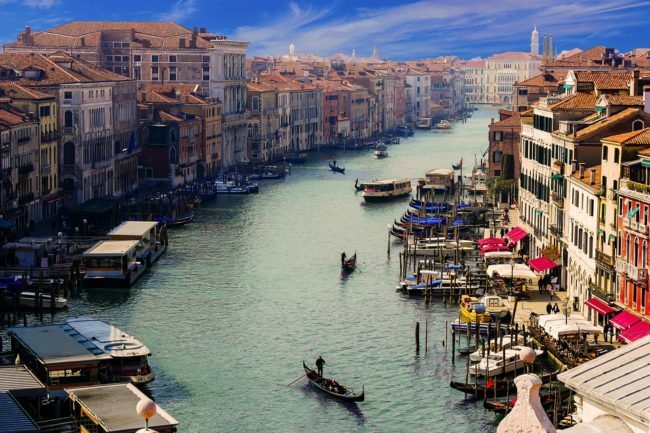 Perhaps you are enthralled instead by Venice, where iconic bridges span historic canals, which glide past ancient castles, palazzos, and villas. Arrive at your Venice wedding ceremony or reception in a romantic gondola. Dine on Italian specialties and enjoy accommodations at one of Venice’s many luxury hotels. Your guests will love attending your luxury Venice destination wedding. Italy’s beauty isn’t limited to just Tuscany and Venice. You can hold your wedding in one of the many small villages surrounding Italy’s famous lakes like Lake Como, near Milan or Lake Maggiore. Not far from the latter is the base of the towering snow-capped Italian Alps where you could uniquely relax at a ski resort and spa before and after your wedding. And there ever-enduring ancient seat of civilization: Rome, one of the world’s most romantic destinations for everything from intimate elopements to grand luxury events for hundreds of guests. Weddings in Italy are a rare treat for guests who can tour the country’s sites for a few days, visiting fairytale castles and the sunny Mediterranean all in the same trip. Excursions are highlights of extended wedding weekends giving you and your loved ones relaxed time to spend together between celebrations and events. The variety of available Italian venues allows you to incorporate local culture and contemporary design into your wedding theming. We can help you weave your personal tastes and style throughout everything from a welcome dinner to a post-wedding brunch. World-class accommodations and renowned Italian hospitality are just two of the many compelling reasons to consider hosting a destination wedding in Italy.